The Travel Channel’s popular TV Show, Man Vs. Food Nation, stopped by Hank’s Haute Dogs recently to film and the episode airs this Thursday, November 30, 2011!!! In Hawaii, the show will be on Basic Cable, Channel 58, at 7:00pm (with a “second helping” at 10pm) and at 4:00pm on Digital Cable 325 (HD 1325). We made a number of specials for Adam to try and only he know what ends up on the show! Don’t worry because you won't miss anything as we’re offering each special at our flagship shop, located at 324 Coral Street, to celebrate Man V. Food Weekend, Dec. 2 – Dec. 5, and it's quite the All-Star Dog line-up we have for you. First up to bat we have the Lobster Fat Boy, our friend Ed’s crazy concoction, combining our specialties: the homemade Lobster Dog and our Fat Boy! That's right, a Lobster Sausage wrapped up in bacon, deep fried and topped with garlic aioli, lettuce, and tomato! Ooh la la, it’s lead-off home run and will be for sale on December 2nd, as with every Friday! On Saturday, December 3rd, following the Lobster lead-off, we are bringing you a taste of Korea with our Seoul Dog. Indulge in batter fries to an all-beef hot dog on a stick, which we then deep fry and pair with a kim chee mignonette (sauce). Haute! Haute! Haute! 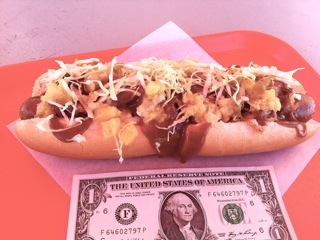 Adam is into big things and we created this monster, The Big Hawaiian! This baby is cooking up at Hank’s on Sunday, December 4th, it’s a half-pound, foot long monstrosity with Kalua Pig, BBQ Poi Sauce, Pineapple Relish, pickled onion, and cabbage! It’s Adam BIG!!! Then it's back to our Chicago roots on Monday, December 5th. 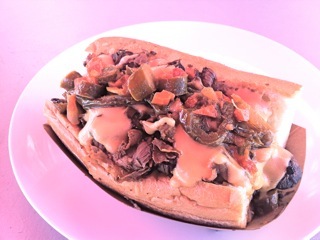 On that day, we take the Chicago Classic Italian Beef Sandwich to another level with the Truffled Italian Beef Combo. The iconic Chicago Beef Sandwich is paired with our house made Italian Sausage then covered with Truffled Cheese Sauce of our Truffled Mac and Cheese fame. 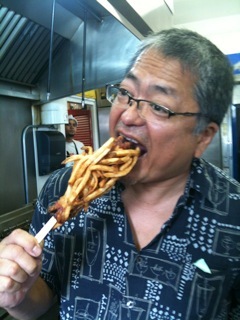 In Hawaii, we say “broke the mouth,” and you better believe this puppy is packing the flavor! So join us for this exciting time. We’ll be delighted to have you dine with us! 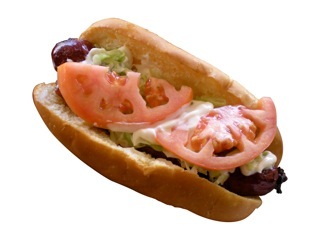 All our traditional items will be for sale as well, so you can be sure to get your Chicago Dog fix! Don’t forget to catch the show! I feel asleep into a deep food coma..... OK, just got to busy and never jumped back in. Thanks for waking me up! I'll work at writing which I love btw, about more adventures in food.